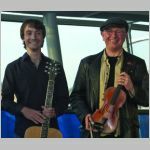 It gives us great pleasure to welcome back Tom the wonderful Geordie fiddler and vocalist with yet another young talented musician and singer David. The onstage rapport between these two and the joy of performing together shine through their performance. Tom’s humour is a bonus both for us and David. Come early for a seat.